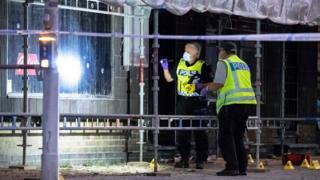 A shooting at an internet cafe in the southern Swedish city of Malmo has claimed the lives of three men. Several others were wounded in the centre of the city late on Monday, when at least one attacker opened fire as the victims left the cafe. Police said there was no indication of terrorism. Malmo has gained a reputation for violent crime. Monday night's attack - which occurred near a police station - is being linked to gangs and organised crime. Witnesses reported hearing about 15 shots fired by an automatic weapon. The gunman is believed to have fled the scene by car. One wounded man was seen being loaded into the getaway car. Three others were treated in hospital. Those killed were aged 19, 27 and 29, police said. At least one of them was known to police, Swedish media reported. While deadly violence has risen in the Malmo area in recent years, the number of lethal attacks almost halved last year, falling from 30 to 17.